It really closes to the airport. Breakfast is OK although it is not too much. You can join local tour and they will pick you up at hotel. 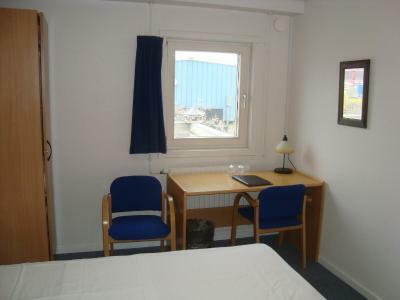 Polar Lodge offers all essentials for travelers that are fine with a relatively basic, but efficient and clean accommodation. 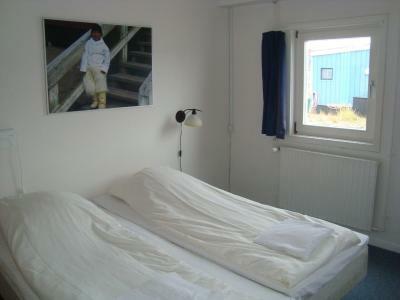 The rooms are relatively simple, but with heating, comfortable bed, desk, and wardrobe. 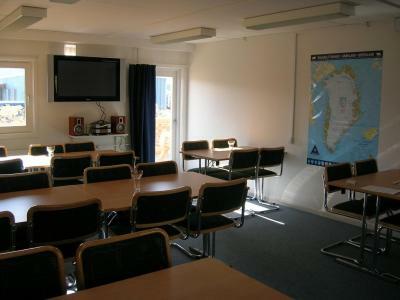 There are several shared bathrooms and toilets and a common room for meals and socializing. 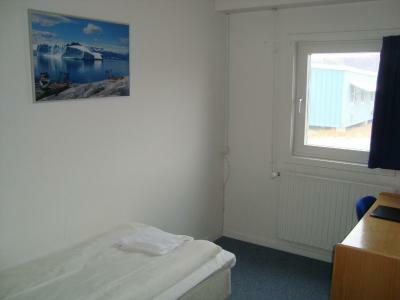 The staff is friendly and helpful, also with regard to arranging tours and transfers in the Kangerlussuaq area. Clean basic and warm room. Free tea and coffee. Communal kitchen and sitting room, would have been nice with some soft chairs or couches to relax in though. Supermarket very close by and the airport right next to the lodge. Stayed with family for one Night. The staff is very friendly and helpfull. Room was spacious and Comfortable. 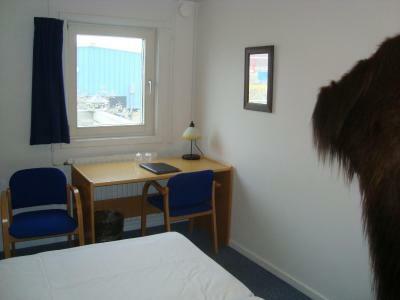 In good Location near the Airport terminal. 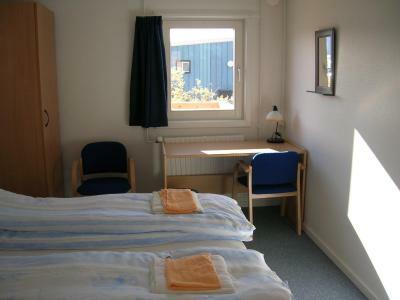 The room is basic/simple but you can't expect much luxury in Kangerlussuat because it is such a small town. 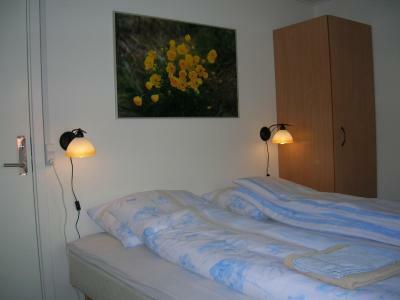 The beds were comfortable and the room was adequate (although small). The breakfast was simple but sufficient (rolls, cheese, cereal, coffee). You are only a 1-2 minute walk from the airport which is incredibly convenient for catching flights. Food options seemed limited so we ended up walking back to the airport where you can eat in the cafeteria or grab a drink in the upstairs bar. 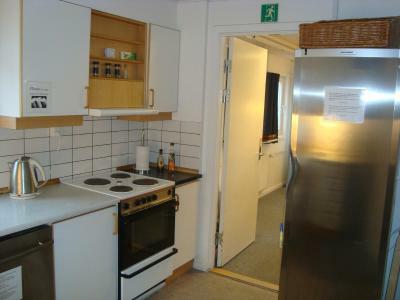 Very close to the post office, supermarket and airport. There's a narrow pedestrian path between airport exit and hotel (quite better than follow the road when snow melts). Very basic breakfast but enough to start the day. Of course it's not a palace but this is Kangerlussuaq... Bed is good, room is warm and clean, shared facilies are clean, kitchen is available (useful because there's very few places where you can eat in the village). Outdoor place to eat must be very nice during summer and very useful to prepare backpack for trips into the wild. 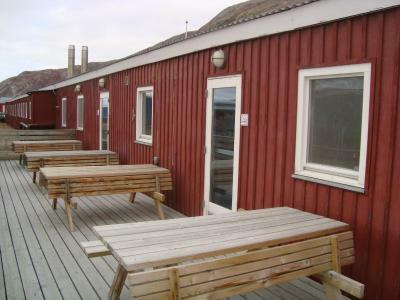 Set on an old American air base, Polar Lodge offers excursions to Greenland’s ice cap, tundra tours and basic rooms with free Wi-Fi. 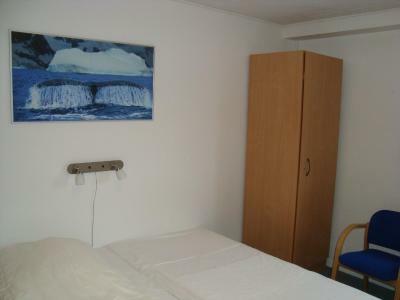 It is located in Kangerlussuaq village, 100 yards from the airport. 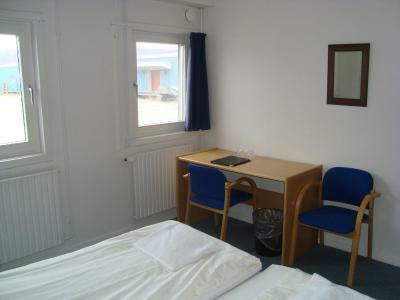 All the brightly decorated guest rooms have a work desk and access to shared bathroom facilities and a communal kitchen. Bicycles can be rented on site. 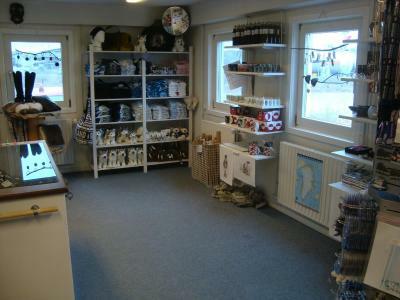 Staff can arrange activities like ice fishing and tours by dog sled or airplane. 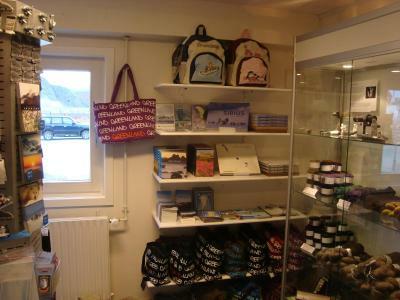 Polar Lodge has a souvenir shop and a communal TV lounge where guests can relax and enjoy breakfast. Mount Hassel is located right behind Polar Lodge. The inland ice of Greenland is just 15.5 miles away. 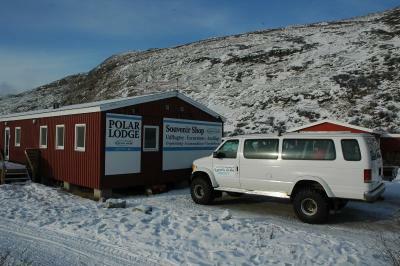 Polar Lodge has been welcoming Booking.com guests since 23 Oct 2013. 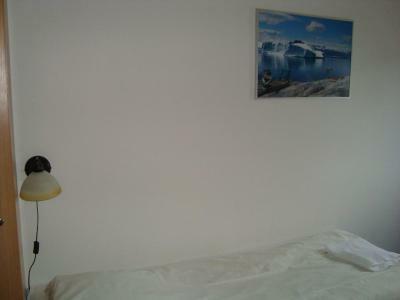 When would you like to stay at Polar Lodge? House rules Polar Lodge takes special requests - add in the next step! One child under 12 years is charged DKK 275 per night when using existing beds. 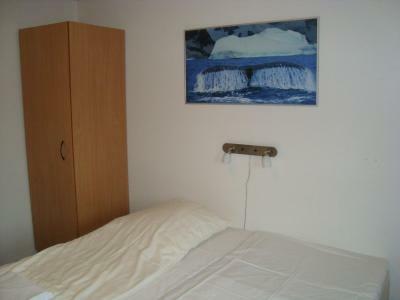 One older child or adult is charged DKK 450 per night when using existing beds. Polar Lodge accepts these cards and reserves the right to temporarily hold an amount prior to arrival. 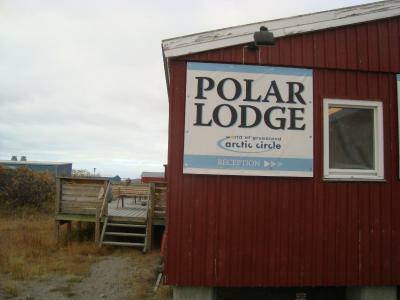 Please let Polar Lodge know your expected arrival time in advance. You can use the Special Requests box when booking or contact the property. If you expect to arrive outside of check-in hours, you are kindly requested to inform the property in advance. Great location! Right at the airport but didn't have to worry about noise - it was quiet in the night. Room is very basic but comfortable. Bathroom is shared but very clean and convenient, much be better than expected. The bathrooms are becoming worn with peeling wallpaper and a loose tap. Expensive internet (like all over Greenland). Check-out time at 9 am is a bit early. Close to the airport, okay breakfast. Child-sized bed, no toilet in room, very early checkout (9am). Facilities in Hotel very Basic and Shared Bathroom facilities not a fan. Close to the terminal. 2 min walking. They arrange activities. Service is different than what you expect. Not friendly but that is fine. Again, you are in Greenland not Bali. Expect no direction, walk in and find your key and go to your room. Pretty simple but not very clear the first time around. It's Greenland. I'm not sure I would bring little children unless the whole family is prepared for limited services, including no wifi. I brought my 10 year old son and we both thoroughly enjoyed staying at the property but even more so camping on the ice. It's ultra convenient to the airport which serves as the town hub of activity. Grocery store is across the street and mountain bikes were great for short excursions (although I wouldn't go too far given their condition). 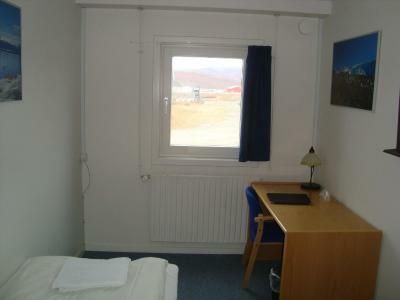 This is the best accommodation in Kangerlussuaq. Maybe, the inflexibility with checkout time, but really we understand your timetables to get everything done each day may be tight. This is not a criticism as you were happy to store our bags for rest to day as required.